The internet of the early 2000s might as well be from a different planet. It was more intimate, more slapped together and personal. Sites like Geocities fashioned themselves after physical locations because for a long time, the internet wasn’t so much a fact of existence as it was a place, a land that existed only in your computer. 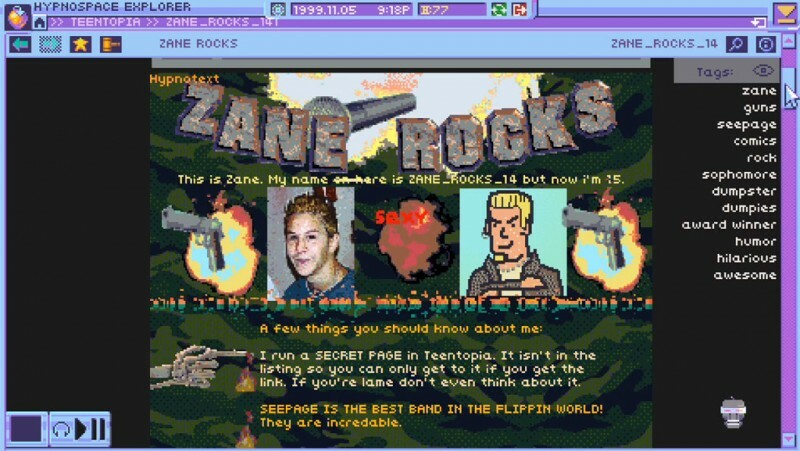 Hypnospace Outlaw (Jay Tholen, Tendershoot) is a game about a kind of internet, in a kind of 1999. It’s not our internet, and it’s not our 1999, but it’s close enough. It’s an alternate history game of the early digital age, where instead of the internet taking off it’s Hypnospace, an interface device that allows you to surf a digital web when you’re asleep. It makes sense—why not use that time for something productive? It’s the conflict between these ideas—the net as a place of relaxation and the net as a place of productivity—that undergirds Hypnospace Outlaw. The company behind Hypnospace is exactly the kind of fake internet mogul of the dot-com bubble you’d expect, a combination of a whiz-kid hacker and his more businesslike brother. To Dylan Merchant, Hypnospace is an open frontier, an infinite realm of possibilities. To Adrian, it is a convenient vector for profit. At the core of the Hypnospace service are brand relationships, fragile agreements between the few companies brave enough to invest advertising in a mostly-untested medium and the developers of Hypnospace, trying to corral their users into not reacting against the brands they’ve convinced to stay. They fail at this task, mostly, and the few attempts of corporate entryism into organic movements are quickly ferreted out by the more eagle-eyed and critical users. It is a very modern interpretation of the brand-service relationship, grafted on top of a very antiquated visual styling. Just as with our real early 2000s internet communities, Hypnospace is a contentious place. Volunteer “enforcers” (paid in HypnoCoin, a currency only valid in Hypnospace) maintain order based on cracking down on activity on Hypnospace that violates the rules of the space. But, as you quickly find out, the rules aren’t enforced fairly, nor are they necessarily meant to be. Because for all that Hypnospace Outlaw is a story about the past internet, it is as much a story about our own, current internet—the internet that grapples with questions of the role of moderation, of brand engagement in community spaces, with ads and branded content. Enforcers are unpaid, but are asked to do the work of anyone from community managers to police, with little to no explanations given to users. Copyrighted content is blocked with an iron fist, unless the copyrighted content comes from a staff member of Hypnospace, in which case rules are built to be bent. The metaphors of Hypnospace Outlaw come across fairly clearly as the game continues: this is a device meant to monopolize time that you otherwise would be resting. It’s a more literal interpretation of the same fears that plagued parents in the early 2000s, of staying up too late on the computer and not getting good sleep. In Hypnospace, you can sleep and browse—so long as you ignore the mild extra tiredness in the morning. It’s the blue-sky optimism of the dot-com bubble reinterpreted through a near-sci-fi lens. The intimacy of Hypnospace is predicated on it being close enough, but not exactly, to the internet that you might remember. There is a physical cost to using Hypnospace that there wasn’t in using the early internet—loss of sleep and frustration. It breeds fast conflict and, in an ecosystem already fragile at the corporate level, leads to quick flame wars and idea propagation. The longer you play, the more you realize that the shiny façade of Hypnospace is built mostly out of risky coding, untested studies and the desperate hope that what is being built here is safe and can be profited on. In that, of course, it is so very familiar. Hypnospace was, in the end, a failure, in-game and in the reality of the Internet Dream of the early 2000s—but that frustrating connection between the need to create profitable spaces and to simultaneously create organic communities within those spaces that are available to be reaped for profit whenever possible is the impetus that builds the modern internet. It’s what fuels investor boards at Twitter, desperate to be satisfied by new product changes even if the user base suffers. It’s what fuels the political think-tanks at Facebook, desperate to find a way to monetize pure user data. It’s the worst conundrum of the modern internet, which creates all of its worst features. So there’s Hypnospace Outlaw, a strange glimpse into a world that never really was, and yet feels like it absolutely could have been. It’s a thrilling mystery, and a near-impeccable use of tone and visuals, but above all it’s a series of questions: what do these communities mean to people? What did they create, why did they create them, who created the scaffolding on which they were built? Who can destroy them? What happens after they’re gone? They’re big questions. They don’t have neat answers. But they’re as relevant now as they were in Hypnospace Outlaw’s alternate 1999. 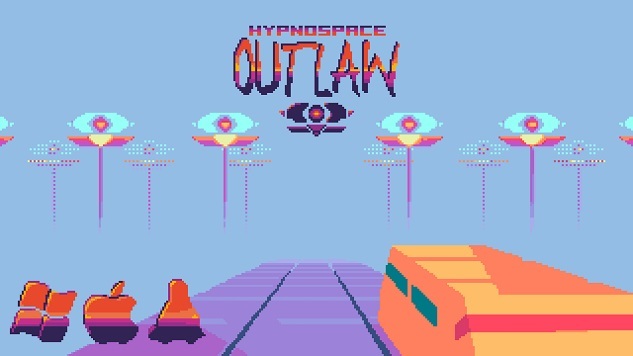 Hypnospace Outlaw was developed by Tenderfoot, Michael Lasch and ThatWhichIs Media, and published by No More Robots. It is available for PC, Mac and Linux.